11/18/17 Patrick Waksmunski / Nebraska v Penn State / Penn State defensive tackle Tyrell Chavis (56) celebrates his sack of Nebraska quarterback Tanner Lee. 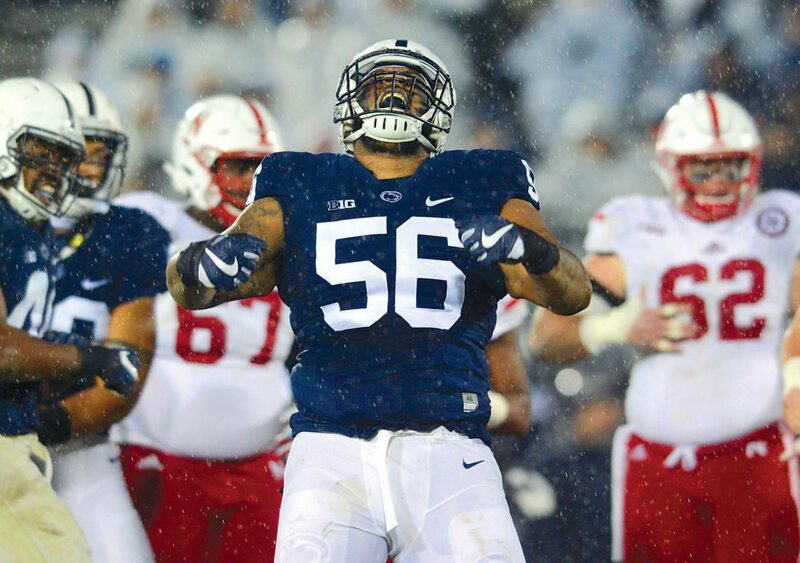 UNIVERSITY PARK — A wild and soggy senior day saw Penn State and Nebraska play a crazy game that set home scoring records, then the Nittany Lions’ best player gave fans some good news afterward. Junior running back Saquon Barkley did not say that he will return for his senior season. He did, however, confirm that he will play in PSU’s bowl game, ending speculation that he would skip it so he doesn’t get hurt before he likely turns pro early. “I will play in the bowl game,” Barkley declared (see Page B12 for more on his decision). The No. 10 Lions throttled struggling Nebraska in the first half, building a 32-point lead, but the Huskers showed some character trying to fight back late. Nebraska scored three touchdowns in the final 6:32, but PSU still won comfortably, 56-44, before 106,722 fans who sat through pouring rain much of the day. It was the highest-scoring game in Beaver Stadium history, and the 44 points is the most PSU has ever allowed at home in a victory. It also capped the second straight season the Lions went undefeated at home. 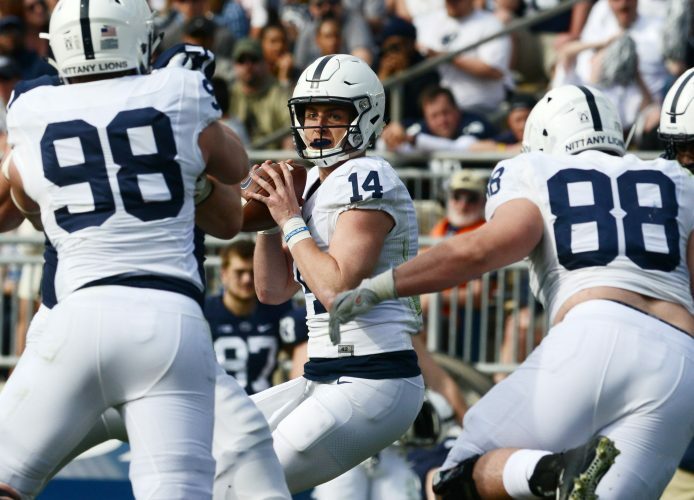 “First half was probably the best first half of football we’ve played, if you look at production and how efficient we were,” quarterback Trace McSorley said after the Lions built a 42-10 lead. Nebraska, with a defense that has been torched by just about everyone this season, got destroyed by Penn State’s offense in the first half. The Lions (9-2, 6-2 Big Ten) rolled up 439 yards of offense in the first half alone — to just 77 for the Huskers — and scored a TD on five consecutive drives for the big lead. Nebraska (4-7, 3-5) actually had a 10-7 lead because of a couple of PSU special teams mistakes, then the Lions clobbered the Huskers the rest of the half with 35 unanswered points. “We wanted to focus on having confidence, bringing swagger and getting back to who we are,” said Barkley, who broke free for a 65-yard touchdown run on Penn State’s third play from scrimmage. Barkley finished with 158 yards rushing on 17 carries and caught a team-high six passes for 66 yards. He’s not the Heisman Trophy frontrunner any longer, but he did have a big game in what was almost certainly his Beaver Stadium finale. McSorley had a big day, as well, completing 24-of-36 passes for 325 yards and three TDs, despite playing in rain most of the game. Penn State looked unstoppable, and Nebraska looked as bad as it gets on both sides of the ball in the first half. The second half was a different story. The Huskers scored 34 points and piled up 389 yards, while the Lions managed only 14 more points. There were, however, some extenuating circumstances in the way the second half played out. Penn State was leading 56-24 with 10:13 remaining, then started playing a lot of backups on defense. Nebraska had a 75-yard TD drive and scored with 6:32 left, then a quick 97-yard drive against the Lions’ second-team defense. The Huskers recovered an onside kick with 1:20 to go and found the end zone again on the game’s final play. Franklin lamented about how it can be tough to know when to insert backups as opposed to continuing to play starters with a big lead. He also was asked if his team took its foot off the gas late. It was a comfortable win, though, and one that probably would have been even more lopsided had PSU continued to play its starters. Nebraska quarterback Tanner Lee, who was in concussion protocol all week before getting cleared to play Friday, had a huge second half and finished with big numbers. He was 26-of-41 for 399 yards and three TDs. PSU linebacker Brandon Smith, who had 13 tackles, gave the Huskers a lot of credit for how they played in the second half. Some of the Lions’ seniors made sure to soak in their last game at Beaver Stadium. Many talked about how there were a lot of emotions before the game, with numerous people tearing up, including Franklin. Tight end Mike Gesicki said he “started noticing stuff in the stadium I never even noticed before” while warming up.